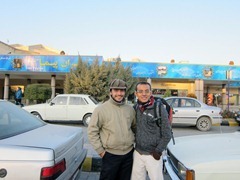 Majid* informed us earlier before we went out for sightseeing that we had to be back home by dinner time. Being used to Iranian hospitality, we’d expect that dinner would be served. 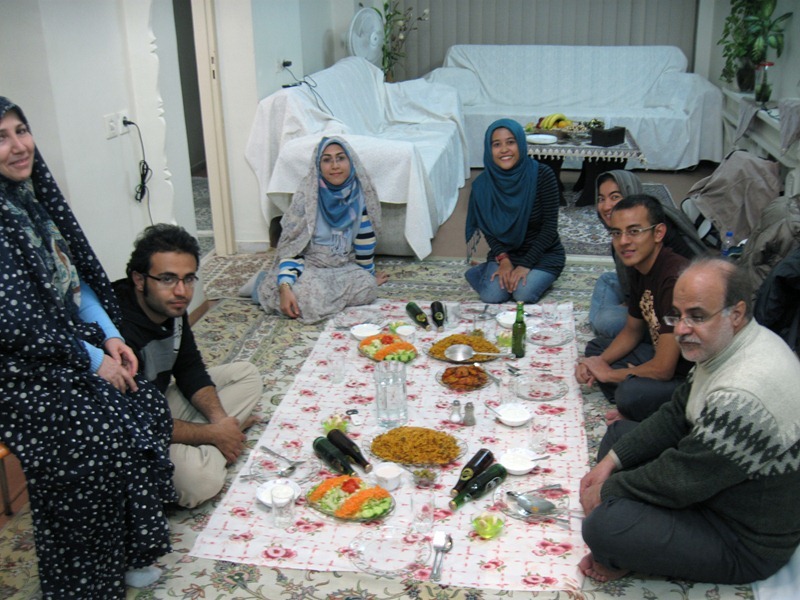 Well, it turns out that not only is dinner served, but Majid’s both parents and brother are invited to join us as well! 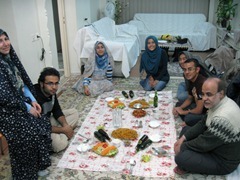 I’m very much honoured to see them and the fact that Majid invites them over and introduces them to us mean a lot to me. 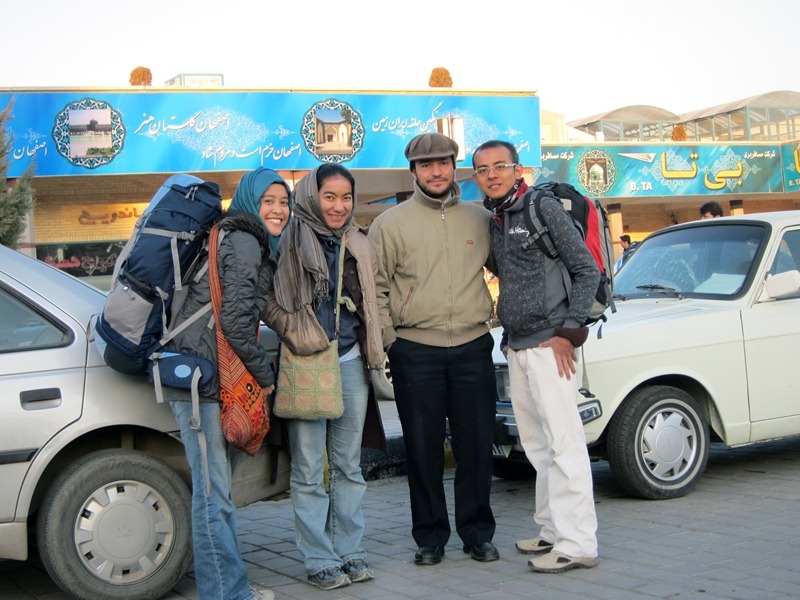 Perhaps because we are the first Muslim CouchSurfer he ever hosted or perhaps because of the fact that Majid and his wife, Zahra* are just very nice to their guests. Whatever that is, I quickly feel that I’m part of their family. 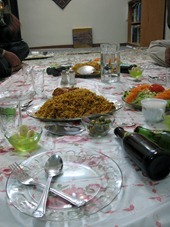 Amazingly, Zahra prepared a “grand” dinner for all of us: biryani rice, salads, grilled potatoes, and desserts. Can’t believe she managed to cook all of these for us! 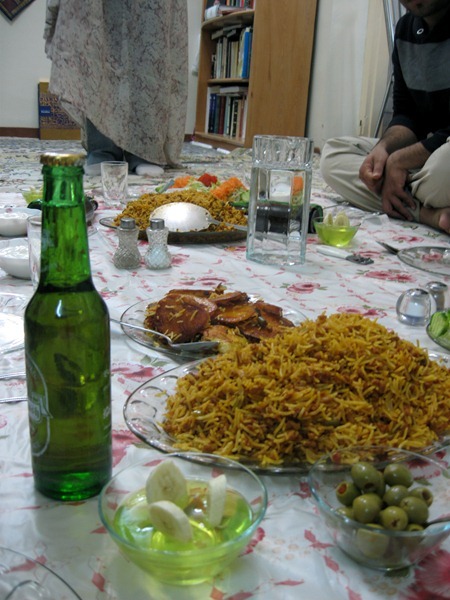 I can say that this is the best CouchSurfing dinner I’ve ever had in Iran 🙂 . After dinner, Ikmal and I join Majid to discuss Shia, the most misunderstood branch of Islam, merely because the majority of Muslims in this world are Sunnis. Our intention in starting such discussion is not to try to convince the other party that his view is wrong, but merely to know and understand Shia from a Shia’s perspective. Majid starts to explain about the fact that Shias believe, that Ali ibn Abi Talib, the cousin and son-in-law of Prophet Muhammad SAW, was clearly appointed as his heir and successor — as mentioned in a number of hadiths (narrations). Majid mentions about the last speech of the Prophet Muhammad SAW during his farewell pilgrimage, in which a number of hadiths narrated that Ali ibn Abi Talib was the true and rightful successor. As he mentions the hadiths one by one, I feel a bit lost as I’ve never heard of the hadiths in my entire life. I know that one of the hadiths mentions about Ahlul Bayt (i.e. the family of our Prophet SAW) and nothing else. Most of the hadiths that he cites are from sources neither I or Ikmal have heard of. Majid goes on to explain about some verses in the Qur’an and I become even more confused as I have never known nor read such tafseer (exegesis). The more he tries to explain about Ali’s rightful caliph and divine position of Imam, the more confused I become. Occasionally, Ikmal and I exchange glances, trying to figure out how to respond to his statements. The discussion continues on and I can see that Majid is very passionate and knowledgeable on this subject. He knows how to answers our “noob questions”, supported with Quranic tafseer and hadiths according to Shia beliefs. It seems clear to me that he wants to clear out all of the stereotypes that Shia people have been wrongly labelled by their Sunni counterparts. The discussion gets even more heated towards the end. Majid becomes increasingly passionate and emotional about the whole thing; especially when he discusses the day when the Prophet Muhammad SAW passed away. Majid explains that, according to Shia sources, the most beloved companion of the Prophet SAW, Abu Bakr RA had a “secret” meeting of which Ali ibn Talib wasn’t told. In this meeting, Abu Bakr RA was appointed as the next caliph. According to Sunni sources, as far as I know, Abu Bakr RA did have such meeting (which I’m not aware of it being a secret meeting). 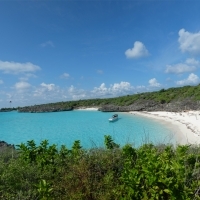 However, we believe that Abu Bakr RA was the most rightful successor as the Prophet Muhammad SAW always spoke highly of him and the fact that he was appointed by our Prophet SAW as the Imam leading the prayer during our Prophet SAW’s illness showed that he was indirectly appointed as the next leader. In the end, I realise that discussing this leads to nowhere as our “historical pieces of evidence” differ. I end up asking Majid what he thinks about Abu Bakr RA and Umar Ibn Khattab RA, both being the companions of our Prophet SAW and the caliphs. Majid responds by saying, “I believe that Abu Bakr, Umar bin Khattab, and others are munafiqun (i.e. hypocrites)”. I was surprised and hurt when he said that. How can he say such a thing when these men had been accompanying our Prophet SAW almost all his preaching life? How can Abu Bakr RA be a hypocrite, when our Prophet SAW was known to have spoken highly of him and to have married his beloved daughter, Aisya? Ikmal and I exchange glances — unable to say anything anymore. We both realise that this discussion needs to be stopped, once and for all. Despite the heated discussion, Majid and his family continue to shower us with kindness throughout our stay in Esfahan. 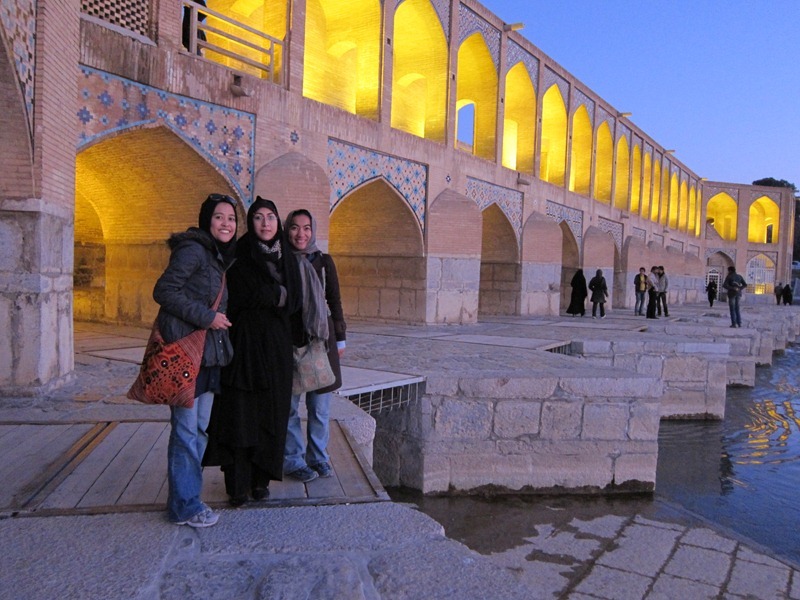 The next day, he introduces us to his friends and shows us around Esfahan. 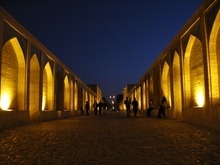 We visit the 33 Bridge (Bridge with 33 arches) at night, which is beautifully lit up. 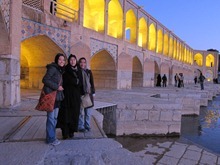 On our last night in Esfahan, Ikmal, Nabilah and I decide to cook for dinner for Majid and his family. We feel very grateful for their kindness and generosity for these past two days — allowing us to sleep in their living room and preparing breakfast for us every single day. In return, we would like to do something small and insignificant for them to show our appreciation. We cook Malaysian style fried rice using whatever ingredients we can find at Majid’s house. It doesn’t turn out to be an awesome nasi goreng, but it’s eatable at least 😀 . After dinner, Majid and Zahra show us their small basement. The basement is used for Majid’s working area and as a temporary storage for their stuff. There’s a computer with an access to Internet, including YouTube and Facebook. 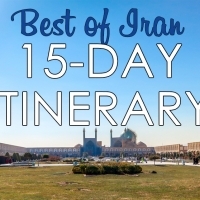 Although these sites are banned in Iran, Iranians — including Majid — have their own way to access them using VPN, which make the ban practically useless. A moment later, Zahra shows us pictures of their wedding party two years ago. 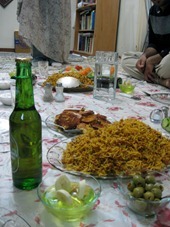 Many Iranians would opt for a mixed wedding party, in which they need to bribe officers in order to have an unsegregated party. For Majid and Zahra who came from religious family, they had a segregated wedding party for male and female guests. With the party being segregated, the female guests can wear whatever they want and dance however they want. It really closely resembles the wedding parties in Saudi. Interestingly, it’s only six months after their marriage that both of them could stay and live together. 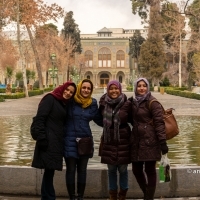 The reason is that Majid did not have a house yet and he had to rent a house and furnish them in order for him to live together with his new wife. After two years living in the same house, Majid and Zahra are planning to move to a bigger house. Zahra complains that the kitchen is too small by Iranian standards. 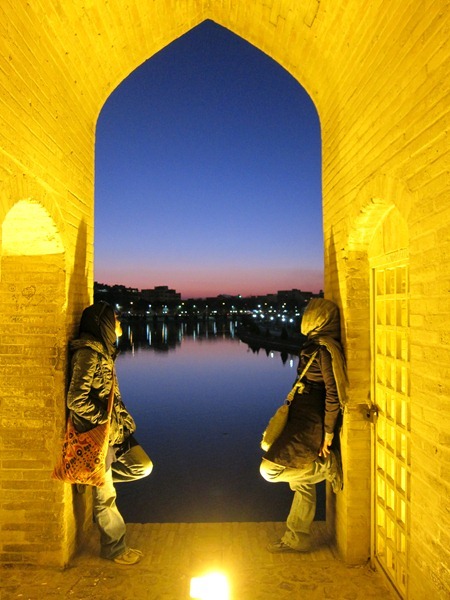 Having visited a few Iranian houses, I have to agree that her kitchen is tiny. Her refrigerator is gigantic, occupying the large portion of the kitchen, that it’s hard to fit three people there. We have such a great conversation in the basement that we don’t even realise that it’s already quite late. 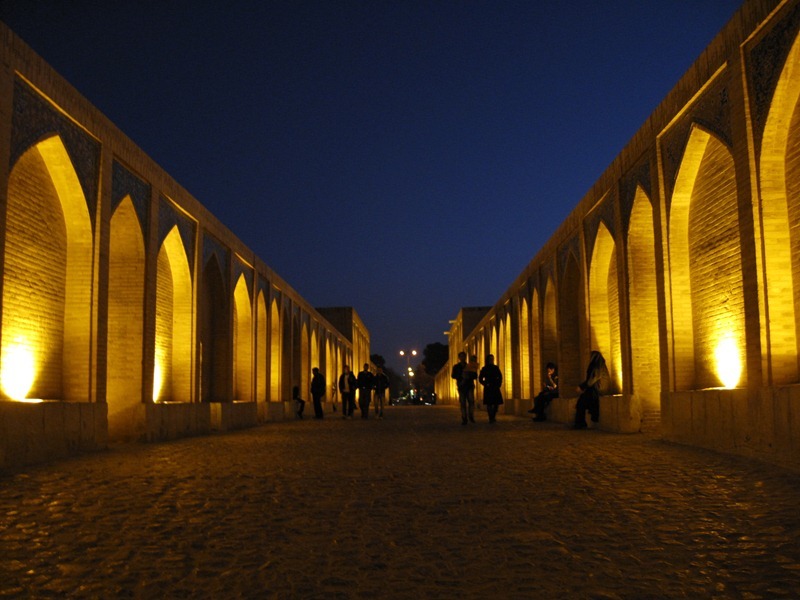 We need to get some rest, as tomorrow is another long 270-kilometre-journey to a Zoroastrian city called Yazd.